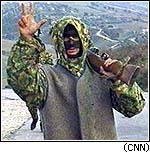 TIRANA, Albania (CNN) -- Albanian rebels seized the last government stronghold in southern Albania Saturday even as negotiators in Tirana reported progress toward a resolution to the conflict. The capture of Gjirokastra, the fifth southern town to fall to opposition forces in a week, secured the rebels' hold over the region. Government forces suffered a humiliating defeat at the hands of the rebels, according to Reuters. The news agency reported that 120 government reinforcements were forced to flee on foot shortly after landing by helicopter in the town which is about 20 miles from the Greek border. The rebels reportedly captured Gen. Ali Kontrakou, head of the reinforcements. In Tirana, former Austrian Chancellor Franz Vranitzky, heading a mission of the Vienna-based Organization for Security and Cooperation in Europe (OSCE), said he had asked President Sali Berisha to extend for two more days, a 48-hour truce due to expire at 6 a.m. Sunday (5 a.m. GMT). "He was very open to the idea and will give it very serious thought," Vranitzky said. Berisha declared the cease-fire Friday after two days of clashes between troops and rebels. The rebellion, sparked by widespread anger over fraudulent pyramid savings schemes in which hundreds of thousands of people lost money, has mushroomed into an anti-government uprising in the south. The rebels are calling for Berisha to step down, new elections and compensation for those who lost money. Vranitzky said Berisha was also discussing with opposition leaders their demand for a caretaker government to run the country until new elections. Rebels who have seized major towns in the south have issued similar demands. Vranitzky said Berisha might be flexible on a proposal to hold elections within 45 days. The opposition objects to the time frame because of a state of emergency in force since last weekend. "It's fair to say there might be a chance for a flexible approach as to when these (elections) might take place," Vranitzky said. Despite apparent progress in Tirana the rebels in the south show no sign of surrender. The rebels continue to add to their already massive stockpile of weapons and are gathering stores of food bracing for a possible attempt by the government to crush the rebellion. "We will not let our arms down until we are convinced that (Berisha) will resign and form a caretaker government," said Xhevat Kocin, a former army general who has joined rebels forces to defend the town of Saranda. Correspondent Siobhan Darrow and Reuters contributed to this report.